WCPO-TV, the Scripps ABC affiliate in Cincinnati has announced plans to begin charging users to access certain parts of its website starting in January in what the station calls a first of its kind move to monetize digital content. The move follows the trend of newspapers putting their content behind so called “paywalls” that require users to pay to read online content that was once offered for free. Many newspapers offer some content for free, such as breaking news or wire stories, or meter the number of stories a single user can access for free during a predefined time period. TV stations, on the other hand, haven’t latched on to the idea — in fact, Scripps says its move at WCPO-TV is the first of its kind. One possible reason for the lack of paywalls on TV websites could be that stations have the advantage, unlike newspapers, of being able to recycle video content for online use and “force” readers to see advertising while viewing the clips in the form of preroll ads. Unlike newspaper websites’ reliance of banner ads, these sponsor messages are more difficult to ignore and, some would argue, more engaging. 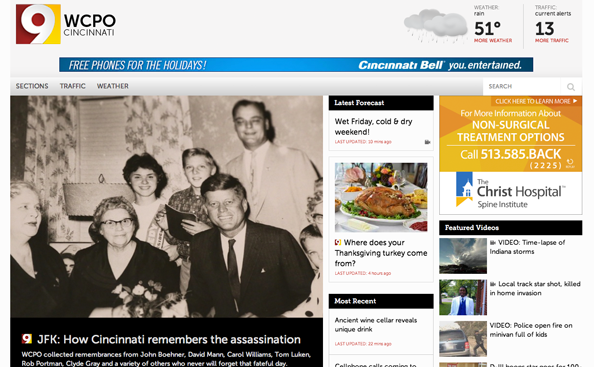 WCPO-TV has started marking stories that will require a subscription with a “9” icon and offers visitors a warning on each soon-to-be-premium story page. No price structure has been announced. The station will still give nonsubscribers access to breaking news, weather and traffic reports as well as “hyperlocal” content and stories from its investigative unit, as well as all video from newscasts (presumably ad supported). Subscribers will also gain the exclusive ability to comment on stories. We did notice one rather odd selection that has been flagged as future premium content: a “Where does your Thanksgiving turkey come from?” seems to be a poor selection since any number of other media outlets around the country are running similar stories around this time. The overall move is interesting and, quite frankly, daring and it will be interesting to see if the decision drives revenue and lasts and then spreads to other stations or users simply turn elsewhere for the content.